Last fall, a stitcher wrote me requesting an all white bridal angel. I thought it sounded like a great idea and designed an angel in a white satin gown edged in light blue and embroidered with pearls. I made her head turn towards the stitcher, reaching out in a beckoning way. When designing I often listen to CNN and while working on this angel, they announced that the body of dear little Polly Klaas had been found. It crushed me as I'm sure it did anyone with a heart. I gazed at the white angel and sketched a little girl reaching out to her. I showed the sketch to some people on my staff and they started to cry and said I just had to put the child in the design. I made the child in a simple, flowing nightgown without lace or ruffles. Her little arm reaches towards the angel. I worked hard on this angel, more than any I have ever done, to make her "perfect". She was not "perfect" until I added the little girl. Originally this angel was to be called the Angel of Peace. After drawing the little girl, I decided to change her name to the Angel of Mercy. I do not know how it feels to lose a child, but I would like to think that this is what happens when a child flies into forever. 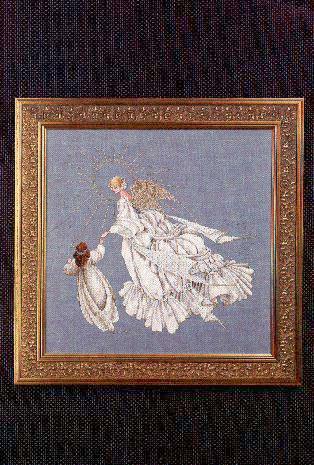 A stitched model of the Angel of Mercy will be sent to the Klaas family and a portion of the sales of this design will be given to the Polly Klaas Foundation. I wanted people to see this scene before they knew the dedication so they would know that she is one of my finest designs. Many times people try to capitalize on a sad event, but this design shows something that happened and deserved to be seen. I knew all of you would understand why I followed my heart on this one. This angel can be stitched alone without the child. Stitched on 32 count Silvery Moon Linen (2 over 2) from Wichelt. 16 1/4" x 16 1/8"
No. X2 Gold Rush thread from Rainbow Gallery.